There are a lot of different recipes for Dolmades. Some recipes add diced tomatoes, currants, pine nuts, cinnamon and allspice to their rice, while others just add fresh herbs and lemon juice. I've been making this recipe for a long time now. I use it to stuff grape leaves, tomatoes, eggplant and bell peppers. Sometimes in place of the sunflower seeds I'll add pistachios, or I'll cut back on the herbs and add currents and cinnamon. Regardless of what I add, it still tastes great wrapped in the briny little package. Serve the Dolmades with Tzatziki Sauce (below) or my Tahini-Mint Sauce, and of course warm pita bread. I added a little Zatar (oregano, thyme, sesame seeds and sumac) seasoning for additional flavor. Note: You'll have a lot of leaves left over with this recipe. This recipe makes about 20 Dolmades. I've purchased the smaller 1 pound jars and ended up not having enough leaves because they were torn. Bring water to a boil, add rice and simmer for about 10 minutes until slightly tender. Drain really well and set aside. In a large saute pan, cook onions, celery and garlic in 2 tbsp of olive oil until soft. Add rice, along with dried oregano, fresh herbs, sunflower seeds, salt and pepper to taste and the juice of 1 lemon. Stir to combine and set aside. Add plenty of water to a large stock pot, and bring it to a rapid boil. Remove grape leaves from the jar and separate the leaves and drop them in the boiling water and blanch for about one minute. Remove leaves and drain well. Sort through the leaves and pick ones that are similar in size and that are not ripped or torn. Also, remove the stem if there is one. The remainder of the leaves can be used to line the bottom of the pot to keep the Dolmades from burning while cooking. I then create an assembly line and work with about 10 Dolmades at a time. I use a small ice cream scooper so that each dolma is about the same size. Lay the grape leaves with the smooth side down, place a scoop of rice near the base of the leaf and roll up tightly like a burrito. 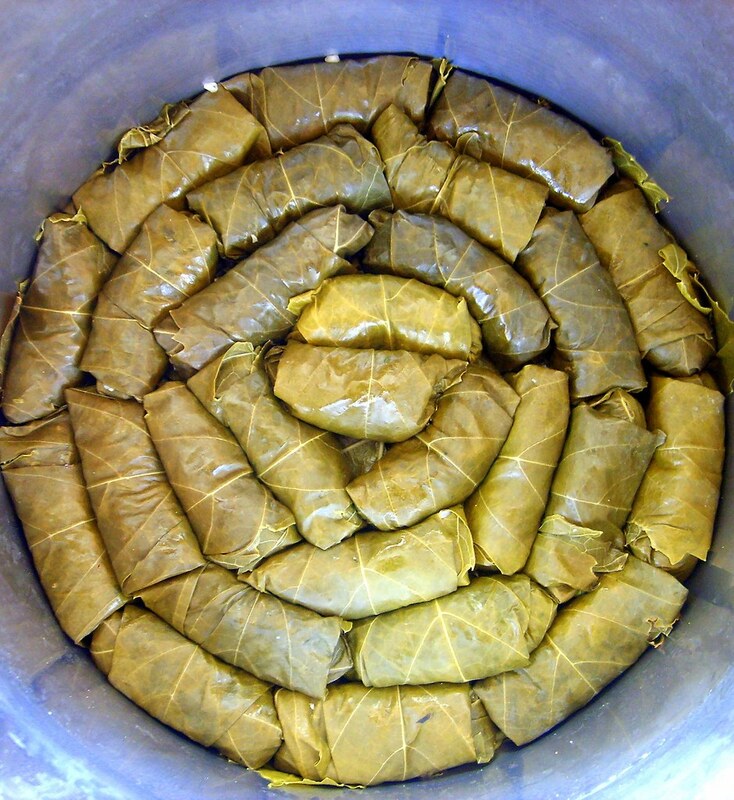 Once all the leaves are stuffed and rolled, line the bottom of the stock pot with extra leaves and place Dolmades seam side down tightly next to each other, working from the outside of the pan to the center. Add enough vegetable stock to cover the tops of the grape leaves by about 1", about 2-2 1/2 cups. Add 2 tbsp extra virgin olive oil and the juice on 1 lemon. 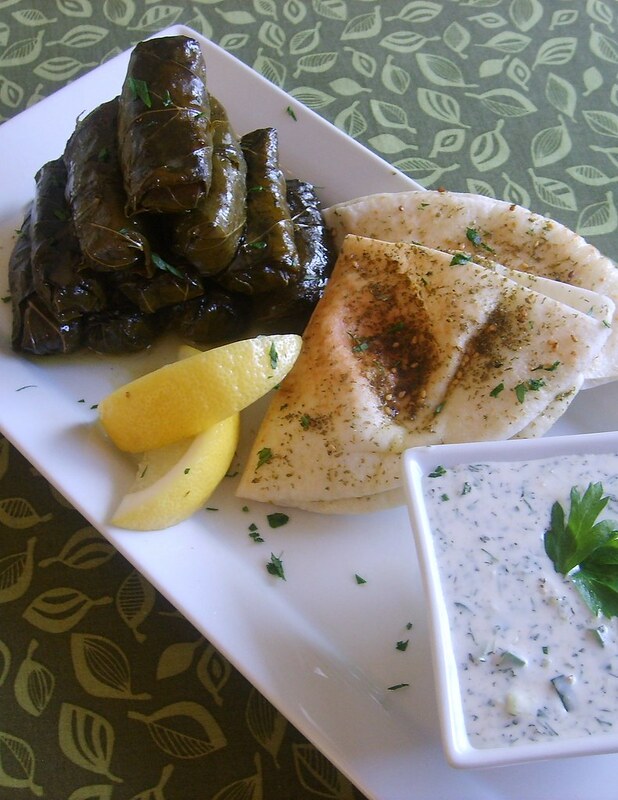 Place several smaller plates directly on top of the Dolmades to weigh them down so that they don't float and open up while cooking. Cover with a lid, bring to a boil and reduce heat to a simmer and cook for about 1 hour until Dolmades are tender. They may take longer or shorter to cook depending on how tough the leaves are. Check during cooking process to make sure that the stock has not evaporated. Add more if necessary. When finished, remove Dolmades and strain liquid into a small sauce pan. Add a pinch of dried oregano and reduce sauce by half. Pour sauce over Dolmades and serve. In a small bowl, mix all ingredients together until combined. Chill until ready to use.